Ken Timmerman was chosen by the Washington County Republican Club to moderate the recent Funkstown CD-6 Republican debate, held last Thursday evening at the Funkstown American Legion. I am going to assume the Republican Club thought Timmerman would be a decent choice to moderate a Republican debate. But those of us who have followed Timmerman’s failed career in politics over the years know that nothing about Ken Timmerman is decent. I’ve had the displeasure of watching Timmerman speak at multiple Republican functions. He’s draining. He’s not even remotely interesting. His speeches are dull, shameless self-promotions of his lackluster books, and the guy has an ego that has far outstretched his tiny head. Really. It’s all about Ken Timmerman. We all want to be relevant and taken seriously in some way or the other, but the distance at which Ken Timmerman is willing to travel to remain relevant is bordering desperation, including haranguing the husband of a CD-6 candidate, allowing other candidates to attack a candidate without warrant and sharing a Red Maryland article in the aftermath of a debate, and editorializing about a Republican CD-6 candidate in that typical condescending demeanor that costed said former congressional candidate an election. This is where you may need to keep your trashcan nearby, just in case you need to throw up. According to multiple sources that attended the Republican CD-6 debate in Funkstown last Thursday, before said debate began, Timmerman approached Amie Hoeber and demanded to speak to her husband, Mark Epstein. Hoeber pointed out Mark in the crowd and Timmerman rushed over to Epstein for a private conversation. This is where you’ll need your trashcan. According to sources that overheard the conversation between Timmerman and Epstein, Timmerman was heard blasting Epstein for not donating to his failed 2012 CD-8 congressional bid – the election in which Timmerman was destroyed in the general by Chris Van Hollen. As the story goes, Timmerman apparently called Epstein, a former executive at Qualcomm, Inc., during his last congressional bid and begged Epstein – like a dog – for money. Epstein apparently rejected Timmerman’s hard ask and politely declined a donation. So let’s get this straight: Ken Timmerman begged Amie Hoeber’s husband, Mark Epstein – like a dog begs for its dinner – for money, and Epstein, who is nothing shy of brilliant, probably decided, like most of us would have, that Ken Timmerman was a bad investment. I mean, a really, truly, awful investment. Timmerman tracked Epstein down before the Funkstown debate was set to begin to give Epstein a tongue lashing for not donating to his goofy campaign. If I were Epstein (Mark is a really nice guy; I’m not) I would not have been as friendly. Timmerman proceeded to host the debate and intentionally target Hoeber. Moderators typically moderate debates; they don’t editorialize. Just watch the videos I posted earlier that show Timmerman parenthetically offering the CD-6 Republican candidates insight into their responses. Timmerman’s actions were reprehensible and unprofessional. In opening the debate, Timmerman claimed he would “stay as much in the background as possible.” He did not follow through on his commitment, of course. The audience and candidates had to listen to an insufferably condescending explanation of what sequestration is. The candidates all know what sequestration means; just listen to their responses. Thanks, Ken, for treating us all like fools. “Amy [her name is Amie, not Amy. At least pronounce her name correctly] Hoeber, the last Montgomery County debate, I watched you, I watched the video of the debate – very interesting – you defended your longtime membership in the National Political Women’s Caucus, a group prominently featuring Nancy Pelosi and the stand with Planned Parenthood icon on its website. And you said they had a strong record of defending women. You also refused to answer a question about yor position on abortion, stating that it was, ‘quote settled law,’” and that many times you have taken an oath of office to uphold the law. Why, also, did Timmerman feel it necessary to inject his personal opinion into the question, saying, “very interesting?” It’s very interesting to me that Timmerman was a failed congressional candidate and was clobbered not once but twice in two elections within two years. That’s “very interesting.” It’s very interesting that Timmerman took the opportunity to plug his books during a congressional debate. That’s very interesting. It’s very interesting that Timmerman didn’t even have the professional courtesy to correctly pronounce the candidate’s names. That’s interesting. What Timmerman did after the debate is “very interesting” and very disgusting and unprofessional. Sleazy Ken Timmerman took to Facebook to share the hack job hit piece written by Red Maryland’s Brian Griffiths, another total miscreant whose unhealthy obsession with Amie Hoeber is bordering an intervention – an article which – surprise surprise – Brian Griffiths lied about Amie Hoeber’s voting record. ‪#‎AmyHoeber‬ ‪#‎votingrecord‬ I moderated the Republican Congressional debate for Maryland’s 6th District in Washington County on Thursday. I came to the debate with no favorite, not even a tilt one way or another, and gave equal time to all. I had not checked Amy Hoeber’s voting record before the debate; and when Robin Ficker accused her of only voting in 2 GOP primaries since she registered to vote in Maryland in 1999, I allowed her to rebut, at which point she said that was not true and that she had voted in all of the primaries. Well, it turns out she lied. And she didn’t just lie, but she lied big time. She has voted in just 1 GOP primary out of 8. (I have independently checked the voter data base and Red Maryland and Robin Ficker are right; i have not checked the other candidates voting records). By the way, I asked her about her statements at the MoCo debate where she called Roe v. Wade “settled law.” She wiggled and squirmed but said that if Congress voted to overturn that judicial activist decision, which was never law, should would consider that to be the “new” settled law. She also acknowledged that she still belonged to the National Political Women’s Caucus, a group that is favored and supported by Nancy Pelosi and Planned Parenthood. Accusing someone of lying when they clearly did not lie is a character flaw, and Brian embodies that flaw, well, flawlessly. Did Hoeber misspeak? Yes, yes she did, I believe. Did she lie? No, she didn’t. Intentionally distorting Hoeber has become Brian Griffiths’ full-time job as of late. Brian Griffiths is obsessed with Amie Hoeber! His obsession isn’t healthy, and it’s bordering creepy! He should think about seeing a professional – and soon! Incidentally, why is Brian Griffiths abusing his privileges with GOP Data Center? By selecting “I Accept”, you agree that you are utilizing the information contained in GOP Data Center for Republican political purposes only. In addition, you agree that under no circumstances will you use this information for commercial purposes. By selecting “I Accept” you acknowledge that any malicious use of GOP Data Center will result in the immediate termination of your user account and may result in further penalties. Brian Griffiths’ access to GOP Data Center should be immediately revoked. Moreover, what kind of sleazy moderator, in the aftermath of a Republican debate, would intentionally use negative information disseminated by ethically-challenged Robin Ficker and liar Brian Griffiths in an effort to smear a Republican congressional candidate? Ken Timmerman went as far as to claim Amie Hoeber lied about her voting record. I didn’t know my voting record until I looked it up the other day. It should be noted that my voting record is incorrectly listed in GOP Data Center. Timmerman’s little social media tantrum over Hoeber was payback for Hoeber’s husband not donating money to his failed 2012 congressional campaign. 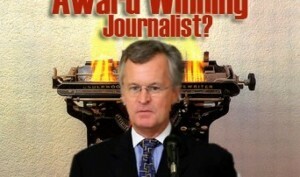 Ken Timmerman: just another sleazy Washington wannabe politician.